Four years ago, I realized that I had discovered the secret to happiness (quite by accident) and I sat down to write a course to teach it to others. I thought that the subject could easily be covered in an afternoon or two, but by the time I was done with my outline, it was 18 weeks of material. Of course, happiness, like any other human endeavor, can be taught to almost any depth. 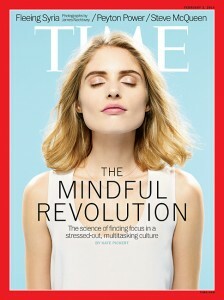 An interloper can pick up the key ideas in a few minutes, but as Goethe said, “God is in the details.” Americans, raised on soundbites and 2-minute YouTube videos, don’t really have the attention span for a class on happiness. They live, as T. S. Eliot described, “distracted from distraction by distraction”. Fortunately, the media is pouring into the breech. 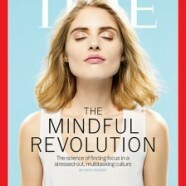 Time Magazine’s cover story this week is “The Mindful Revolution.” Happiness is going mainstream. Study after study has confirmed that doing stuff for other people makes you happier. It’s just that simple. In one experiment, a group of students was given $5 and told to spend it on anything they wanted. Another group was told they had to spend it on someone else (like buying a latte for a stranger at Starbucks.) At the end of the experiment, the second group was much happier. Human beings were designed to move, not sit around at stare at glowing screens. Research confirms that physical activity not only keeps you healthier, it also makes you smarter and reduces the cognitive decline associated with aging. So get up, go outside, and walk around, throw a ball, and play with the dog or something. The ability to multi-task is largely a myth. Research proves that doing multiple things at once introduces errors and reduces your overall performance. But much worse than that, it makes you less happy. “Flow” is a form of joy and happiness that occurs when we become so absorbed in an activity that we lose ourselves and time seems to stand still. It’s where we do our best work (or play). But flow takes time to get into; at least half an hour. And it can be destroyed completely by even a short interruption. “Be here now” is great advice. Don’t squeeze in lunch with a friend and spend the whole time thinking about all the work you have to do when you get back to the office. When you are out with someone, turn your phone off. When you get back to work, focus on the task at hand and turn off the distractions. And certainly don’t drive and text. Your brain tricks you into thinking that you are attending to both tasks very well. But your brain hides other things from you too, like the fact that your eyes are completely closed every 7 seconds while you blink. Ben Tal Shahar, who taught Harvard’s wildly successful class on happiness for 10 years, recommends keeping a gratitude journal. Everyday, at a regular time, take a moment to reflect on the five things from today for which you are most grateful, and just write them down. Big things, little things, this cup of hot coffee; it doesn’t matter. Want to kill two birds with one stone? Skip the writing, but before you go to bed at night, spend a couple of minutes with your special loved one and just tell each other what you are grateful for. This also meets the requirements for number 1 on this list, for a double bonus happiness score. Spending too much time considering choices (which shirt to buy, where to go on vacation, even which jar or jam to buy) causes anxiety. And it makes you less happy AFTER the choice because you keep wondering if you made the right one. In a simple supermarket experiment, a display with 3 types of jam far outsold a display with 12 types of jam. Decide what your minimum requirements are for an adequate solution, then make the first choice that delivers those requirements and STOP THINKING ABOUT IT. You’ve got a lot of other things to do today. In the long run, the extra 1 or 2 percent of optimization won’t matter. Better to spend that time where it can pay off. Human beings are social animals. That’s why we crowd into cities, why we build churches and country clubs, and why we like restaurants and bars (ever see the TV show “Cheers”?). Being a part of something, be it a church or a chess club, keeps us grounded and makes us happier. In an ever-increasing and ephemeral world, it’s important to belong somewhere. Kids are happy because they know how to play. They appreciate the power of foolishness. Blowing bubbles, having a Nerf battle, playing make believe, singing in the shower and just plain being silly on a regular basis will make you happier. Unfortunately, as we get older, we forget how fun it is to camp out in the backyard or build a fort from discarded Christmas trees. I think this is part of the reason for the popularity of the maker movement, where people are designing and building and decorating their own stuff, from food to clothes to personal electronics. Not only do you get to be creative, but making things also engages you in “flow” (see number 3 above). My research into helping people find happiness in a world that would frankly rather eat them for lunch eventually led me to getting a master’s certificate in executive coaching. So now, rather than teaching a semester-long course on the topic, I work with individuals 50 minutes at a time through my company Farsyte. Maybe some day I’ll finish writing the course, but for now, I’m happy. Thank you for sharing this very simple and accessible list of ways people can become happier. From my 30 yrs experience as a psychotherapist, I can attest to the great results one can achieve by practicing these ways of being. The challenge, as I see it, for many people is that learning how to be happy, or eat healthy, or be more organized is half the battle. Most people know what they need to do to become more fit or successful etc. Their challenge is HOW? We are habitual creatures and many of our behaviors and attitudes have been ingrained in our brains before the age of 5. Changing these patterns and habits can be very challenging since our brains are wired to habituate to conserve energy. Our brain literally resists us when we attempt to create new habits. If we want to shift a particular behavior and attitude, we need more than words, we need a strategic and comprehensive program which takes into consideration our brain’s resistance mechanism. We also need social support to reflect the unconscious behaviors so that we can intercept them as they are occurring and replace them with our new desired behavior. I appreciate your wisdom and service. I would love to hear your thoughts on this. Sending love. Wow! Thanks for the great comment! I totally agree that knowing what to do is only half the battle. Research shows that 45% of the “decisions” that you make during a day are really just the unconscious execution of habits. I wrote a blog post about this on Farsyte.com called “Getting off autopilot in the new year.” I hope you enjoy it! I’m really glad you liked it. Thanks for sharing! I LOVE this. Totally spot on, and massively timely as we enter this New Year of the yang wood horse! Saddle up, ride forth, create and BE HAPPY!